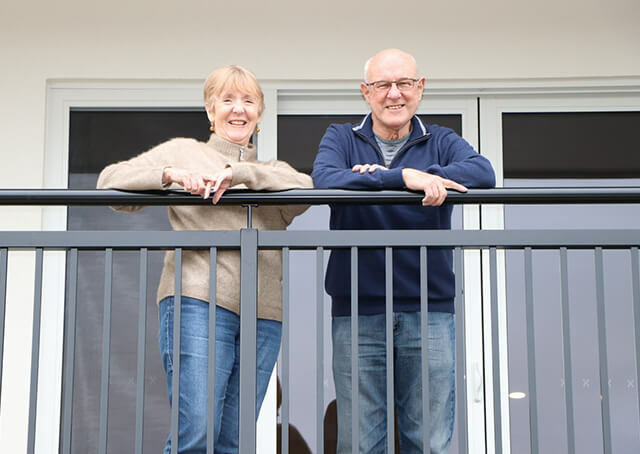 Anne's long journey to Nellie Melba retirement village started with a vow to stay in her family home “forever and a day”. It ended this month with an audible “wow!” as she and her husband, Stephen, walked into their beautiful, sun-drenched two-bedroom apartment. Stephen was a believer from the beginning. “We do a bit of caravanning and we had a five-bedroom house - two storey - with a reasonable-sized garden,” he says. “If we were going away you had to worry about the garden, you've got to come back and clean all that up. “I didn't like the idea of living like this,” she says, gesturing to the large corner apartment she’s now sitting in. As Stephen started making serious inquiries about the village Ryman Healthcare planned to build in Brandon Park – only about 1000 metres from their home of 48 years – Anne’s mind was beginning to open to the idea. “Gradually I realised this is a big house to clean - even though you don’t use it you still have to clean it. And I used to do the garden and I used to be able to do the back garden and front garden all in the one day. Ask Anne how she feels about the decision to move into Nellie Melba now and her scepticism is replaced by a broad smile. “Rapt. Yeah, best decision. Rapt. That day when we walked in here [we thought], 'We're here at last' and we just went 'Wow!' when we came in. “We're home now, yes, we're home.